This Thai chili squid recipe is super yummy, healthy, and easy to make. And if you serve it with glass or rice noodles (as in this recipe), it makes a one-pot meal complete with plenty of nutritious vegetables. The squid is stir-fried briefly, so it is very tender and never rubbery. You can also simply serve the stir-fried squid with plain rice. Makes a terrific seafood dish for any occasion, even in the winter (frozen squid works just as well as fresh). Includes gluten-free instructions. Place noodles in a bowl or pot, and cover them with warm water. Allow them to soften while you prepare the squid. If squid is frozen, quickly thaw by dunking squid in a bowl of warm water. Place squid on a cutting board. Slide your knife along one side of the squid to open each tube. Lay the pieces of squid flat. Optional: score the squid with diagonal slices. Score first one way, then the other to create diamond-shaped cuts. Tip: When scoring, try to cut through half the thickness (If your scores are too superficial, they won't be apparent when cooked.) These cuts will "open up" while cooking and give the squid extra visual interest and texture. Slice the [scored or unscored] squid into smaller, bite-size pieces (e.g. triangular and rectangular pieces). Put aside. In a pot or bowl, mix stock with oyster sauce (or wheat-free soy sauce) plus sesame oil. Heat to near-boiling. Remove from the burner and add the drained noodles. Stir well. Cover and set aside. (Noodles will absorb this sauce and still be warm when you're ready to serve them). Place 1-2 tablespoons oil in a wok or frying pan over medium-high heat. Add the garlic, ginger, carrots, beans, mushrooms, and eggplant (or other vegetables of your choice). Stir-fry 2-3 minutes, or until vegetables are soft. Stir-frying Tip: Add a little water to the wok/pan when it becomes too dry instead of more oil. Now add the squid plus the stir-fry sauce. Stir-fry for about 2 minutes, or until squid curls up and the meat is tender. Do not over-cook, or squid will become rubbery (3 minutes maximum). Do a taste test for salt, adding 1-2 more tablespoons fish sauce if not salty enough. If too sour for your taste, add a little more brown sugar. If not spicy enough, add a little more chili. To serve, slide noodles onto a serving platter. 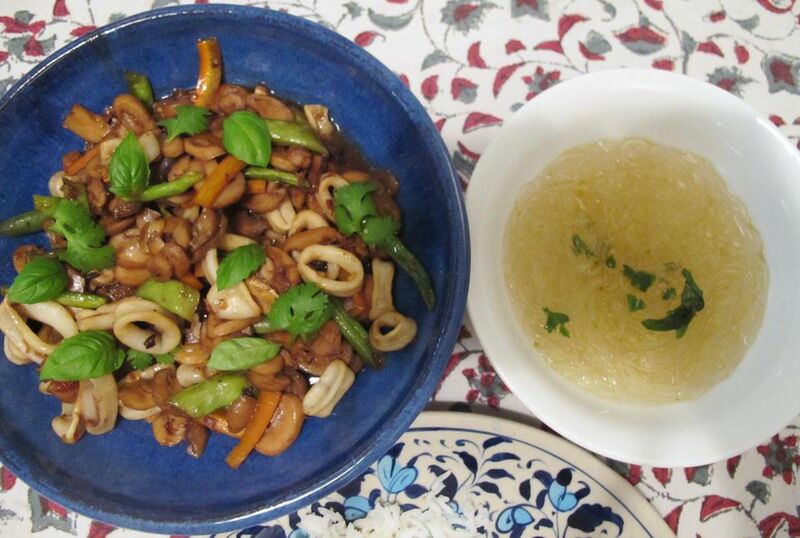 Top with the stir-fried squid and vegetables. Add sprinklings of fresh basil and coriander, and enjoy!